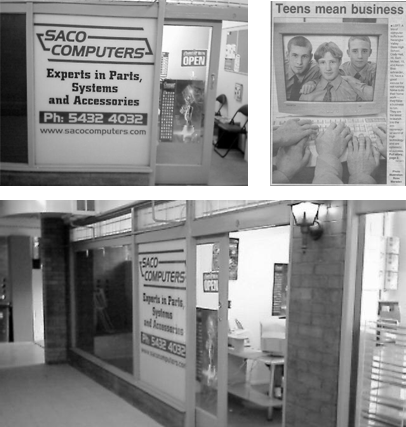 The SACKO Story - SACKO was created from humble beginnings in 2001 and was then known as Saco Computers. It operated as a small computer retail shop based in King St Caboolture which is located around 45 minutes from Brisbane. During our initial grand opening the local media covered our story with a front page article. This article become well know among the local community due to the unique story of 3 teenagers turning their technology skills into a business all whilst juggled studies. Business quickly grew and due to this the original founders Cody, Aaron, Sam and Craig expanded the business to larger premises and extended the trading hours after only a little over 12 months in business. Due to these changes and the continual changes in the computer industry the business name was changed to Saco Technology. Over the next several years in our larger location our client numbers continued to grow and reached over 1000 home and business customers. The new larger location and extended trading hours allowed us to achieve record turnover numbers and for the first time we broke the million dollar sales mark. Our staff numbers continued to grow and so did our product and service range. The company has become well know in the business community after winning a local business award and to further contribute to the community we started to participate in clean up Australia days as well as offering local training to school students who were interested in a career in the IT industry. During this time the business really began to change from its traditional client base and now started to focus on not just selling computers and computer hardware but a real focus on offering repairs and support to home and business customers. During 2005 Aaron one of the founders decided to pursue university studies and left the day to day operations for Cody to handle. In 2006, Cody took ownership of the company from the other original founders and transformed the business from a computer retailer into its current model of being a service based IT company. During these years the company continued to adapt to the ongoing technology changes that were occurring and double digit growth was achieved year on year which has continued to this day. In 2012 the company changed its name to SACKO and further expansions of our product/service range continued as did the growth in the SACKO team numbers. Also in 2012 we launched our new franchising system to allow us to further help small to medium businesses with simplying technology around Australia. Many years were spent developing the concept of building a network of franchisees throughout Australia to provide a COMPLETE range of IT products and services for businesses. SACKO is 100% Australian owned and operated meaning the profits stays here in Australia and are invested in Australia. Therefore by choosing SACKO you are supporting Australia and investing in the future of the country. Due to the unique approach that we offer by only selling though local IT specialist throughout Australia, SACKO franchisees can offer individualised personal one on one service and support which no other business in the industry can offer. This also allows us to offer exceptional value for money as we can combine the buying power of all the members of the network thus allowing us to pass this saving on to the customer.